Someone has misunderstood the nickname convention for replacing M with P. Martha = Mattie = Patty = Patsy. That’s understandable, but when they then fabricates an additional proper name out of a nickname, I have to wonder about the quality of their research. Do they make other incorrect inferences? So for the record, her name was only and ever Martha Bishop. 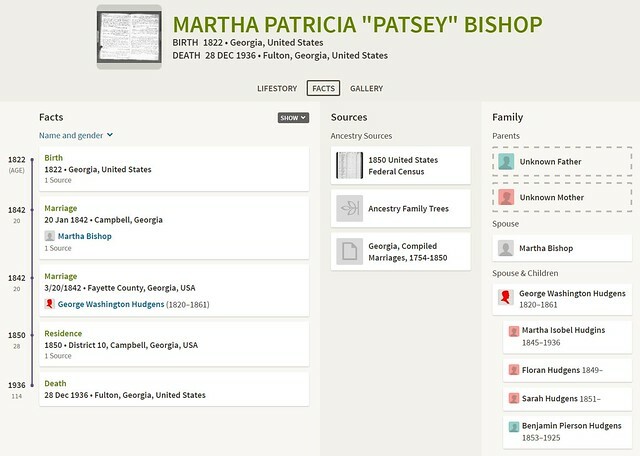 Patsy/Patsey was just a nickname for Martha. ETA: Also, that death date. It is absolutely not correct, but I have no i idea where it’s coming from. A bunch of member trees for Martha include it. The best I can tell is that she died between the 1900 and 1910 censuses. It’s possible she remarried after her second husband, Samuel Thompson, died. I doubt it, though. Martha is, by the way, the unnamed wife in Samuel Thompson’s will. Martha is not, however, her own spouse. This tree is a giant hot mess. A nickname convention in general or in your family? It’s a general convention. It seems to have mostly disappeared in the early 1900s, but if you have English speaking ancestors before that time, you’re likely to run into it. It’s the same convention that gives us Peggy as a nickname for Margaret. The M in Meg becomes a P.
I wonder if this has to do with the recycling of common names in families? It’s hard to tell 2-3 Margarets apart, but if one is Meg and one Peggy, it becomes easier. I knew about Peggy for Margaret, but I didn’t know about any others. Do you have other examples? It might help find people . . . . Thanks so much! Not off the top of my head. You see things like Ted or Ned, for Edward, and Sally for Sarah. This is kind of interesting. It’s more from a linguistics viewpoint than from a genealogy. Interesting. I had never heard of Hudde. Me, either. A lot of these names/nicknames died out with the Victorians. The rest just aren’t popular anymore.